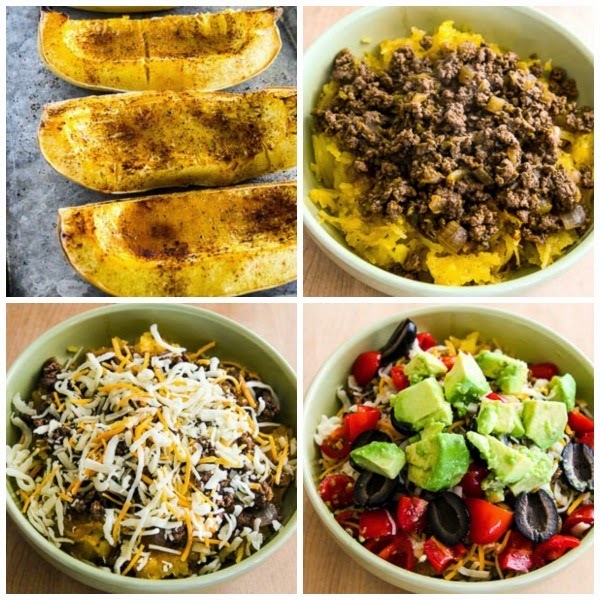 This Spaghetti Squash Low-Carb Taco Bowl has all the flavors that make you love beef tacos in a spaghetti squash bowl! This tasty dinner is low-carb, Keto, low-glycemic, gluten-free and South Beach Diet Phase One, and if you omit the cheese and sour cream it can also be Paleo. Use the Diet-Type Index to find more recipes like this one. Click here to PIN this tasty spaghetti squash taco bowl! I’m a huge fan of spaghetti squash, and if you haven’t discovered the deliciousness of spaghetti squash yet, maybe this Spaghetti Squash Low-Carb Taco Bowl is going to be the recipe that gets you to try it! I know some people think of spaghetti squash as mostly being a low-carb substitute for pasta, but personally I put it in a class all its own, and I’ve enjoyed it in casseroles, sauteed with vegetables, in a gratin with chard, and in a twice-baked casserole with pesto, to name just a few. The only hard thing about about making this Spaghetti Squash Low-Carb Taco Bowl recipe is cutting the raw squash apart before you season it and roast it. Some people like to microwave the squash for a few minutes to make it softer, but I just hack away at it with a big knife. I prefer roasting the squash for spaghetti squash bowls like this, because you can season the squash and the roasting process dries it out a little, but if you prefer you can cook the spaghetti squash in a slow cooker or in an Instant pot or even cook it in the microwave. Cut the spaghetti squash into four pieces, scrape out seeds, rub with olive oil and season with chili powder, Spike Seasoning, and pepper, and roast the squash until it strings apart easily, about an hour. While the squash cooks, brown the onions, brown the ground beef, and season the beef with Spike Seasoning, Kalyn’s Taco Seasoning, and pepper. The squash is done when it’s lightly browned and strings apart easily with a fork. Divide the hot spaghetti squash into four bowls. Top each with one-fourth of the slightly-soupy hot beef mixture and grated cheese. Garnish Spaghetti Squash Taco Bowls with diced tomatoes, sliced olives, and chopped avocado and devour! Preheat oven to 400F/200C. Spray a large baking sheet with non-stick spray or olive oil. Cut spaghetti squash into fourths lengthwise and scrape out the seeds and stringy part. Brush or rub the surface of the squash with olive oil and season with chili powder, Spike Seasoning and black pepper. While the squash is roasting, heat 1 tsp. olive oil in a large frying pan. Add the chopped onion and cook over medium-high heat until the onion is starting to brown slightly, about 3-4 minutes. Add the ground beef to the pan (adding more oil if needed). Cook the ground beef until it’s nicely browned, breaking apart with a turner (or use an old-fashioned Potato Masher like I do to break the meat apart.) Add the Spike Seasoning and Kalyn’s Taco Seasoning and cook a couple minutes longer. 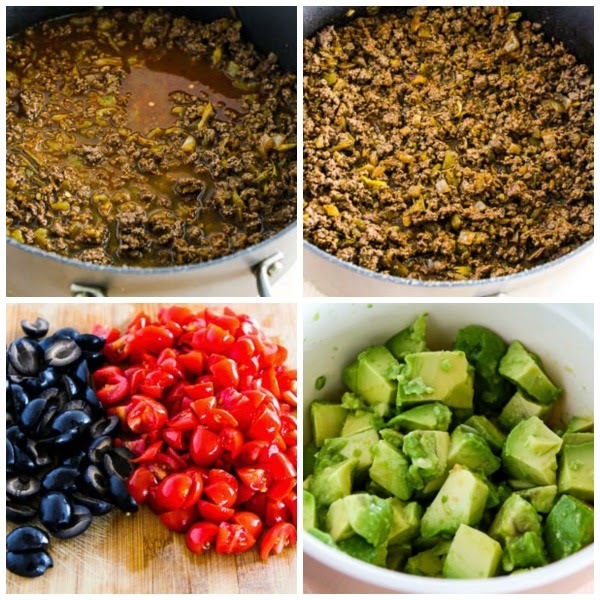 While the meat simmers, cut up the tomatoes, drain olives and cut in half, and chop avocados and toss them with the lime juice. Remove the spaghetti squash from the oven when it’s slightly browned and strings apart easily with a fork. Let squash cool a few minutes until it’s easier to handle, then use a fork to scrape the “spaghetti” part away from the skin, discarding skin. Divide the spaghetti squash into four bowls. Top each bowl of squash with one-fourth of the saucy meat mixture, grated cheese, tomatoes, olives, and avocado. Serve with sour cream and salsa to add at the table as desired. If you omit the cheese and don’t serve it with sour cream this recipe can easily be made Paleo. 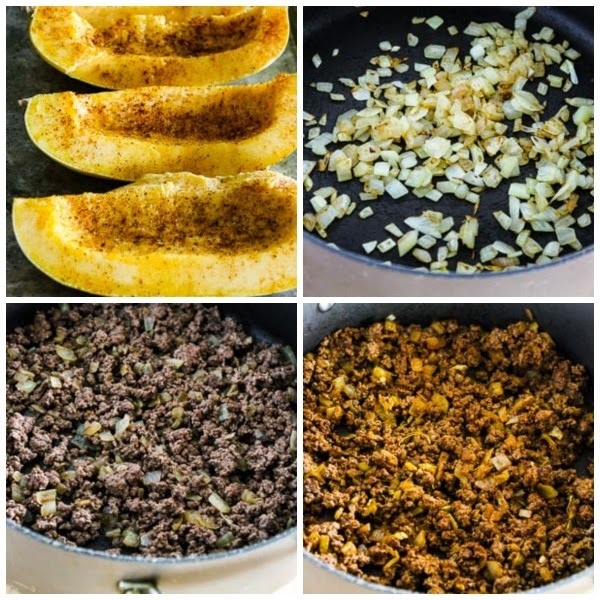 If you’re making Spaghetti Squash Taco Bowls for the South Beach Diet, they would recommend using lean ground beef and reduced-fat cheese (and sour cream, if using.) South Beach also limits avocados to 1/3 per day. With those cautions, this would make a great meal for any phase of the South Beach Diet, and it’s also good for any other type of Low-Carb eating plan. (Even if you’re on a plan that doesn’t require lean beef, I would prefer it here since you’re not draining any fat from the meat.) If you omit the cheese and don’t use sour cream, this recipe fits my category for Can be Paleo. Does 2 T of taco seasoning refer to tablespoon or teaspoon? That is the abbreviations I use in all my recipes; hope that helps! Would be nice to have breakdown of calories, carbs, protein, fats. I love having my favorite recipes on a low-carb option! This looks amazing, can’t wait to try it! All of your recepies are so mouth watering, thank you for them. Definately will try this one at the weekend. Thanks Agnes; hope you enjoy! Will this meat freeze well? I live alone so I need to be able to freeze or keep the meal for more than a day… Thanks in advance. I haven't frozen this but I don't think its that suitable for freezing. The spaghetti squash and the beef mixture can certainly be kept in the fridge for a few days, but the topping needs to be made fresh. I made this tonight using ground turkey instead of ground beef but otherwise following it faithfully. It was delicious! Everyone loved it! My only issue is it was kind of liquidy at the bottom – I think from the squash. I wondered if I overcooked it. Would it be better to put it in a sieve after I scrape the squash? I didn't think the meat mixture was too liquidy but maybe it was . . . Anyway everyone cleaned their plates so it didn't really matter! Michelle, so glad you enjoyed it. I don't think spaghetti squash released much liquid when it's cooked, so maybe just cooked the meat mixture slightly longer. When you scrape your spoon across the bottom of the pan where the meat has cooked, it should stay separated so you can see the dry pan for a minute. Duly bookmarked for next year's harvest. I had 12 this year and enjoyed every onet. Like you I treated a lot of them like a regular vegetable. Katie, I am so jealous of your garden. Glad you like the idea; hope you enjoy it when you try it! I'm definitely on a spaghetti squash kick, too. This recipe ticks all of the flavor buttons for me. Lydia, glad you like it. Kara and I gobbled it up when we tested the recipe!